In a good year, you might get the chance to do something new and maybe a little scary. In 2018, I got to do that twice – first with the book coming out, and then with my jump over to The Athletic. For extra fun, both happened at roughly the same time. Mix in the end of Biscuits and the arrival of Puck Soup, and it was… well, it was something. It was an experience, one I'm still sorting my way through. But as with just about all of the other interesting things I've had a chance to do over the years, I'm very aware that I only had the opportunity because of people like you who read my stuff. Some of you found me recently. Others have been here since there were a few dozen of us making jokes about JFJ a decade ago. But you're the only reason I get to do any of this, and I'll always be grateful. To those who've followed me behind the paywall (or were already there), a sincere thank you for making it possible for people like me to do this for a living. For those who are still on the fence, I'll work hard to win you over one day. If I lost you this year, here's holding out hope that our paths will cross again down the line. But whichever group you're in, I want to wish you a very happy 2019. May you get the opportunity to do some interesting things. And may your hockey team win it all, or at least be worth making fun of when they lose. The​ rankings took last​ week​ off,​ so​ with​ two​ weeks of​ action to account​ for we should​ expect​ to see a higher-than-usual​​ level of turnover in both the top and bottom five to the extent that blah blah blah let’s talk about how the Dallas Stars have gone looney tunes. Seriously, I realize that this is a power rankings piece and I should stay focused on which teams go where. But I have a few rules in life, and one of them is that if a team’s CEO kicks off the weekend by going on an expletive-laden rant that would make the corpse of Harold Ballard blush, it gets to be the lead story. If you haven’t read the rundown in Sean Shapiro’s piece yet, you must do so immediately. And if you have read it, you need to read it again to convince yourself that you didn’t dream it. Go do that now, then come back. Done? Cool. Now that you’ve read the story, learned some new curse words, and your screen is covered with the singed hair that used to be your eyebrows, let’s figure out what all of this means. Point one: I don’t think Dallas Stars CEO Jim Lites is super-happy with Tyler Seguin and Jamie Benn, you guys. It’s subtle, but it’s there. Is he right? Well, no, not really – Seguin and Benn don’t seem to be the problem in Dallas. But that hardly matters now, since it’s not like these are the sort of comments you can walk back. Point two: Man, the timing is weird here. The rant came the night after the Stars went into Nashville and shut out the defending Presidents’ Trophy winners. That win was their third in five games, and moved them back into a wild-card spot. You’d think you might want to build on that, not use it as a starting point to go scorched earth on your two franchise players. And finally, the biggest point of all: It’s hard to imagine any way in which this helps the Stars, either now or in the future. Benn and Seguin didn’t sound happy on Saturday, as you’d expect, and while neither poured any additional gas on the fire the NHLPA is now getting involved. Both players are signed to long-term deals, and even if the Stars wanted to trade them – ownership denies that they do – it would be hard to pull it off in a way that made the team better. And which players are going to be lining up to replace them at the top of the lineup, now that the entire league knows that the Stars are an organization that will publicly humiliate its top players when things are going well? And it wasn’t just about Benn and Seguin. Lites’ comments didn’t just bury his two stars; they sure seemed to imply that GM Jim Nill could be under the gun too. He probably should be, given the teams’ recent record, but having management advertise the fact publicly can’t make his job any easier. Maybe the biggest problem with Friday’s meltdown is that it wasn’t spontaneous or off-the-cuff, meaning it appears to reflect the agreed-upon thinking of the organization from the top down. And when you strip away the profanity and the hyperbole, that thinking seems to boil down to: We’re already good enough – “too good”, in fact – and we just need to try harder. Not scoring enough goals? Just “get a little bit closer to the action”, as Lites put it, and the problem is solved. It sure sounds easy when you put it that way. Unfortunately, that’s not the sort of thing that a struggling team comes up with after any sort of serious self-reflection. It’s wishful thinking, the sort of feel-good story you tell yourself when you don’t have the guts to admit that there are bigger flaws in play. Maybe it works, and Lites’ tirade ends up inspiring the team. Maybe it doesn’t but ends up coinciding with a win streak and we all decide to pretend it somehow helped. Or maybe the boss just torpedoed a season, or even more than that. We’ll find out. At the very least, we can say the Stars are interesting again. For three years they’ve been that team you forget about when you’re going through the Central in your head and get stuck at six teams. Not anymore. On to the power rankings. We have two weeks to work with, which should shake up our rankings. Let’s find out just how much. Saturday was the rare case of the league breaking out the maximum 15-game schedule. Then they went and played just one game last night. That’s a bit weird for fans, but as someone who writes most of a weekend wrap column on Sunday afternoon, I’m all for it. 5. Winnipeg Jets (24-12-2, +22 true goals differential*) – They’re opening up some space on top of the Central. But the loss of Dustin Byfuglien will hurt, and the offence has only managed multiple goals in one of their last five games. This week’s schedule is a fun one, with the Oilers, Penguins and Stars on tap. Last​ week, we had​ some​ fun​ with​ the​ NHL’s​ playoff format.​ Since everyone likes​ to complain about​ today’s​ system, I pointed​​ out that the league has never been able to get this right. For over 100 years now, through dozens of different systems, there’s always been something wrong. Lots of people told me they enjoyed the post. They learned something or at least had a good laugh. But then, inevitably, came the follow-up: OK then, smart guy, can you come up with something better? When Gary Bettman retires and I’m named his replacement, I already know what the new playoff format will look like. If you want to be surprised when that day comes, stop reading now. But I took my shots at the league’s century of playoff format failure, so it’s only fair that I make the case for what I believe would be the correct answer. It’s an idea I first floated over five years ago, and I’m sure I’m not the only one to come up with it. And in a few minutes, you’re going to be on board too. The first step in building our new format is that we’re going back to using conference-based seeding for the first round. The top eight teams in each conference will make the playoffs, regardless of division, and they’ll be seeded one-through-eight based on standings. I’ll stop here to acknowledge that we’ve already got a problem, because conference seeding means we’re going to reduce the chances of seeing those divisional rivalries the league loves so much. It’s one of the main reasons we have the current division-based format – because the league wants to see matchups like Boston/Montreal or Los Angeles/San Jose as often as possible. Those pairings are still possible in a conference-based system, but they become less likely. Some fans won’t care, but I happen to love those rivalry matchups. I think they’re part of what makes playoff hockey great. If you do too, and you’re disappointed that my format will feature fewer rivalry matchups, I’m going to ask you to hold that thought for a few more paragraphs. So yeah, we’re back to conference-based seeding. This is basically how the system worked from 1994 through to 2013, although we’re throwing in a new wrinkle: We won’t be automatically giving the top seeds to the division winners. In fact, the division winners won’t matter at all. If the best three teams in the East are all in the Atlantic, then they’ll be the top three seeds. If the Central has six of the eight best teams in the West, then all six make the playoffs, in whatever order they’ve earned based on their regular season records. No automatic seeding for division winners. That will strike fans as odd, since we’re used to the league always rewarding division winners with a top seed. But there’s really no need to. I’m not going to get into whether or not we’d use a balanced schedule for this format because it really doesn’t matter. But if the schedule is balanced, with all the teams in a conference playing each other an equal number of times, then the divisions don’t really matter. And if its unbalanced (like it is now), then a team that wins a weak division has played an easier schedule and already had an advantage. There’s no reason to reward them with another one once the playoffs start. So we’re seeding each conference one through eight, without regard to division winners. And yes, that detail turns out to be important in a moment. The first round has each conference playing the typical matchups: 1-vs-8, 2-vs-7 and so on. In Round 2 we re-seed, so the highest-ranked team left plays the lowest. This ruins the concept of filling out a bracket, which some fans enjoy, but it’s a sacrifice we’re willing to make. All of this means that the two best teams in the conference or even the league can’t end up playing in the second round, like happened last year with the Jets and Predators, and could happen this year with the Lightning and Leafs. So far, so good. We’re two rounds into the playoffs, and there are four teams left, two from each conference. A few minor wrinkles aside, this isn’t all that different from what fans were used to a few years ago. And then, something very simple yet beautiful will happen. - Should Joel Quenneville go to Philadelphia? I list out some pros and cons. - And we celebrate the return of the Whalers by breaking down the 1980s beauty of Whalermania. Hey everyone... some big news to share. I've joined the team over at the Puck Soup podcast, and will be part of the hosting team with old pals Greg Wyshynski and Ryan Lambert. I'm very excited to be back in the podcasting arena, and to have found a new home where I can sigh wearily about the NHL. I've missed doing Biscuits, and while this show won't be quite the same I think it's going to be a ton of fun. You can hear the three of us run down the biggest stories in hockey each week, then listen to me go awkwardly silent when the discussion shifts to pop culture and I have no idea what Greg and Ryan are talking about. It should be great. The show runs every week, and I'll be part of most of the episodes going forward. They also have a Patreon which entitled supporters to bonus episodes, including one each month where Greg and I will cover NHL history and/or make fun of Gary Bettman's haircut; you can find out more about that here. In this week's episode, we cover the Flyers coaching situation, the Hurricanes becoming the Whalers for a night, Tom Wilson's latest impact and lots more. It’s​ the most wonderful​ time​ of​ the​ year.​ Specifically,​ the time​ of year for​ everyone to start​ complaining​ about the playoff​​ format. It’s pretty much an annual tradition. By this point we’re far enough into the season that the standings are starting to firm up and we can look ahead to potential matchups. But some of those matchups don’t seem to make sense. In the East, three of the four best teams are all in the same division, meaning two of Tampa, Toronto and Buffalo would face each other in the first round. That’s not fair! And it’s also not fair that you could conceivably have teams like the Lightning and Leafs finish with the two best records in the conference, or even the entire league, and still end up playing in the second round. That scenario played out last year in the West with Winnipeg and Nashville and we could see the exact same thing with those two teams this year. It could end up like 2017, when the Blue Jackets had the fourth-best record in all of hockey, and had hit the road in Round 1 to face the No. 2 Penguins and everyone was furious. Well, probably. The current format has some advantages, including an emphasis on divisional matchups that create the sort of rivalries that make the sport so much fun. Maybe that’s an acceptable tradeoff in your book and maybe it isn’t. You might prefer to see the league go back to conference-based seeding. Or maybe you have some other idea. But whatever your view, you’ve probably expressed frustration at the NHL’s ever-changing format. After all, how hard can it be to get this right? Well, hold that thought. Because as it turns out, the NHL’s playoff format has never made sense. Like, ever. When you look back at 100+ years of NHL history, you realize that having an unintuitive playoff format that confuses everyone and leads to weird matchups is just one of those hockey traditions that we all may as well get used to. Because it’s much pretty much always been this way. Don’t believe me? Let’s take a closer look back at the various formats the league has used over the years and see if we can find one that made everyone happy. Spoiler alert: We will not. We can give the NHL a bit of a pass for being all over the map in its formative years. The league was brand new, with teams coming and going, arenas burning down and occasional influenza outbreaks derailing everything. It was a different time. But even with that in mind, the league did some things that would strike us as odd today. For the first few seasons, it divided the season into two halves (which were “halves” in name only because they usually didn’t contain the same number of games) and had the team with the best record from each half play each other for the league title. And if the same team won both halves, as the Ottawa Senators did in 1920? Then there weren’t any playoffs. They just skipped them altogether. After a few years of that, the league dropped the halved-season format and had the top two teams in the standings play for the title. But instead of playing a best-of-something, the teams played a two-game total goals series. That format was then expanded to three teams in 1925 … or at least it was supposed to. But the first-place Hamilton Tigers went on strike and were suspended, meaning the league title was determined by a meeting between the second and third-ranked teams without the best team even taking the ice. 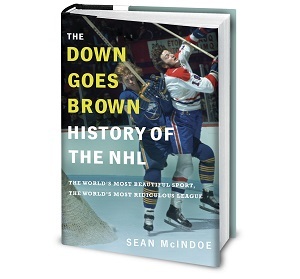 Mix in the fact that none of those championships even determined the Stanley Cup winner – in those days, the NHL champ still had to face a team from another league for that honor – and it was a bit of a mess. But again, the league was new. Surely they’d figure it out in the second decade. By 1926-27, the league had ten teams divided into two five-team divisions called the American and the Canadian, which seems pretty straightforward until you remember that one of the teams in the Canadian division was the New York Americans, at which point you’ll need to go lie down for a while. But by 1928-29, the NHL had come up with a format that would last for the next decade. Three teams in each division would make the playoffs, with the second and third seeds facing each other in a two-game series. So far so good. But try to guess who the two division winners played in the opening round. If you said: “Nobody, because they got a bye,” then you understand how playoffs should work and can go watch some other sport, because this is the NHL and nothing has ever made sense. No, the two division winners played each other. In the first round. In a best-of-five. That was their reward for finishing first. One of them would be eliminated right away, while the other would survive to face whichever team emerged from the non-division-winner bracket. Weekend rankings: Is Ovechkin the best ever? What the hell just happened in Philadelphia? Nobody​ was surprised when​ reports​ emerged​ yesterday​ afternoon​ that​ Dave Hakstol​ had been fired.​ We’d all kind​ of​ figured it was​​ imminent, and when the Flyers closed out a brutal road trip with an ugly 5-1 loss in Vancouver, well, that was that. You never want to see anybody lose their job, but at some point you have to put a guy out of his misery, right? So sure, Hakstol getting fired yesterday was no big surprise. But his replacement was, with Joel Quenneville reportedly getting the job. That was, needless to say, a great hire. It’s a franchise-changer. If you were a Flyers fan, you were thrilled and maybe even feeling some optimism for the first time all year. It started with a more careful reading of the initial reports. The Flyers hadn’t actually fired Hakstol or hired Quenneville; rather, they’d made the decision to do that. That seemed like a distinction without a difference, but as the afternoon wore on, the situation got murky. The Flyers didn’t announce anything, although that was probably just because they were still in the air on the way back to Philadelphia. But then they landed, and still nothing. At one point, there was a lost pair of shoes. It became apparent that if Hakstol had been fired, he didn’t seem to know it. Then came the denials. First from Quenneville, and eventually from the Flyers themselves. Hakstol was still the coach. And at least as of first thing this morning, he still is. It was, as they say, a fluid situation. Then again, so is a bad stomach flu. There are a few possible explanations. The first, and most straightforward, is that the whole story was just wrong. Somebody got bad information. It happens. The Flyers were never going to make a coaching change, at least not yesterday. But that ignores all the other signs that a change was imminent, which doesn’t make the simple explanation feel like the right one. It’s also possible that the story was right, and that the Flyers had decided to replace Hakstol with Quenneville, only to have something go wrong. Maybe the “something” was the story leaking out early, or maybe it was something else. Or maybe the story was half-right; the Flyers were going to make a coaching change, but Quenneville wasn’t the guy. If so, the story coming out the way it did screws everything up, because anyone they hire now will seem like a step down from a three-time champion. Or maybe they’re just going to make the move today. Whatever happened, it’s hard to see a way forward for the Flyers that looks good. Even if they hire Quenneville this morning, fans will wonder what happened over the weekend. If they hire anyone else, he’s not Quenneville. And if they stick with Hakstol now, well, good luck to the poor guy. We’re officially onto the first, full-blown crisis of the Chuck Fletcher era, and he needs to pick a path forward and communicate it clearly. And then we’ll wait and see if this time, it sticks. Meanwhile, this seems to have been the week where some real buzz started building over the ridiculous season that Alexander Ovechkin is having. The 33-year-old is up to 29 goals in 32 games, including two hat tricks this week and another goal on Saturday, and is leading the race for what would be his eighth Rocket Richard Trophy. That’s led to a couple of water-cooler debates. The first is whether Ovechkin can realistically catch Wayne Gretzky for the all-time goal-scoring lead. He’d need almost 260 more goals to get there, which seems impossible. Then again, what he’s doing right now seems impossible, we can’t rule anything out with this guy. And even if he doesn’t catch Gretzky, there’s a good chance he can get past Jaromir Jagr for third spot, and maybe catch Gordie Howe for second. For a guy who played his entire career in the Dead Puck Era, that’s amazing. That leads to the next question: Even if he doesn’t catch Gretzky, is Ovechkin still the greatest goal scorer of all-time? On an era-adjusted basis, he’s already passed Gretzky, although he’s still well back of Jagr and especially Howe, who gets a boost based on having done most of his scoring in the conservative 50s and 60s. We’d also have to include guys like Maurice Richard, Phil Esposito and both Hulls in the discussion. But none of them won eight goal-scoring titles. That “greatest ever” argument is one that people have been making for years now, and the answer has always seemed to come out to a hedge along the lines of, “He might be, especially if he keeps it up.” Well, he isn’t just keeping it up, he’s getting better. Can we just drop the qualifiers and say he’s already the best ever, right now? If he hangs up his skates tomorrow, has Ovechkin already done enough to be considered the best goal-scorer in hockey history? I kind of think he has. I grew up in awe of Gretzky, and I’ll still occasionally go back and watch old clips of him cutting into the zone and teeing up one of those patented slapshots where the puck seemed to turn on its side in the air and blow past a helpless goalie. But that’s exactly it – Gretzky played in an era where forwards were allowed to cut into the zone with enough time and space to wind up a slapshot and the goalies really were helpless. Even the good ones. Ovechkin is doing it in the era where every goalie is 6’6″ and plays every angle perfectly, and gap control and shot-blocking are basically religion. It’s amazing. - Should the NHL expand the playoffs? I'm not sure, so I looked at both sides of the debate. It’s​ been almost two​ weeks​ since​ the​ end​ of​ the William​ Nylander contract saga,​ with its twists​ and​ turns and last-minute​​ buzzer-beater resolution. As the round-the-clock coverage fades into more reasonable daily updates, we’re trying to sort through the various details that are emerging on how this deal was put together. One of those details is Nylander’s apparent belief that Kyle Dubas has promised not to trade him. Nylander says he has assurance from Dubas he won’t be traded while he’s the GM. Because of the way the CBA works, the personal word of his GM is the only sort of trade protection Nylander can get; players aren’t eligible for no-trade or no-movement clauses until the reach their UFA-eligibility seasons. So Nylander has to rely on Dubas to hold up his end of the bargain here. And Dubas probably will – after all, trading Nylander wouldn’t make much sense for the Leafs, and this is a rookie GM who’d no doubt prefer to establish a reputation as a straight-shooter. Assuming Nylander’s version of the conversation is accurate and Dubas really did give his word, there’s no reason to think that the young winger has anything to worry about here. But just to be safe, he might want to stop reading right about now. Because as it turns out, NHL history is filled with players who’ve believed they’d been given the same sort of assurance that Nylander says he got from the Maple Leafs. And more than a few times, those promises turned out to not be quite as ironclad as the player would have hoped. So today, let’s look back at a few of the (many) trade scenarios in hockey history that started with a firm handshake or at least a perceived wink and nudge and ended with a player angrily mumbling about loyalty while packing a suitcase. We’ll start with what may stand as the most famous example of the genre: the 1975 blockbuster that saw the Bruins trade Esposito and Carol Vadnais to the Rangers for Brad Park, Jean Ratelle and a minor-leaguer. It was a monster deal, one that saw New York acquire the player who’d led the league in goals in each of the last six seasons. And it didn’t make Esposito very happy. That was because he’d signed a new contract that summer that he assumed would let him finish his career in Boston. He’d reportedly been offered $2.5 million on a five-year deal to join the WHA’s Vancouver Blazers, but took roughly half that to stay with the Bruins. According to Esposito’s version of events, Harry Sinden promised him that he wouldn’t be traded, and even offered to write a no-trade clause into the deal, which at the time was rare. Esposito says he told the GM not to bother, and that his word was enough. Weeks later, he was gone. The trade, of course, ended up being a steal for the Bruins. Esposito played well in New York, but Park became the best player in the deal. And it got even more lopsided when the Rangers decided to reunite Esposito with center Ken Hodge, and sent a young Rick Middleton to the Bruins to get him. Park and Middleton became key parts of the late-70s Bruins teams that nearly won the Cup. The star-studded UFA class of 2019 aren't signing extensions. That's rare, and history suggests it's bad news for their teams. One​ of the biggest​ stories​ of​ the​ NHL​ season​ is what’s​ happening with the​ star-studded free agent​ class​ of 2019. And​​ what’s happening is: not much. That’s a big deal. Every summer, we look ahead to the following year’s potential free agents and get excited over all the big names. And every year, almost all of those big names end up signing extensions long before they get anywhere near free agency. By the time July 1 rolls around, there’s rarely much star power left. But so far, that hasn’t happened for most of the class of 2019. A few big names have signed, including Max Pacioretty, Pekka Rinne, Blake Wheeler and Ryan Ellis. But that’s left several top stars who still need extensions, and who are now less than seven months away from hitting unrestricted free agency. We can start with Erik Karlsson in San Jose, who could end up being one of the offseason’s biggest stories for the second straight year. The Blue Jackets have both Sergei Bobrovsky and Artemi Panarin. Buffalo’s Jeff Skinner is having a career year. And the Senators have both Matt Duchene and Mark Stone. Those six players would all figure to hit the jackpot if they made it to the open market. But the list goes on, with names like Wayne Simmonds, Jake Gardiner, Joe Pavelski, Jordan Eberle and Cam Talbot all on expiring deals. And then there’s Anders Lee and Eric Staal and Tyler Myers and Mats Zuccarello and Semyon Varlamov and … you get the picture. The list is stacked. Karlsson is expected to use Drew Doughty’s $11-million cap hit as a starting point. Bobrovsky and Panarin could both be looking at deals that would carry cap hits north of $9 or even $10 million. Skinner won’t be far behind, and Duchene was on track to get there too before his groin injury sidetracked a career year. Stone is in the same ballpark, although he can’t officially sign an extension until Jan. 1. And many of those other names figure to be looking at cap hits that would at least start with a six or seven on a multi-year deal. That’s a ton of talent, and a ton of potential money. Hockey fans might be wondering whether it’s unusual for this many big-name pending UFAs to make it this far into the season without an extension. The short answer: Yes, it’s extremely unusual. For the longer answer, and what it might mean for 2019, let’s dive into the recent history. Most star players sign extensions relatively early. Some do it right on July 1, the first day they’re eligible; we saw that this year with Doughty and Oliver Ekman-Larsson. Others take a few weeks, like Jonathan Toews and Patrick Kane in 2014, or even make it past opening night, like Brent Burns last year. But by the time the calendar flips over to December, most of the big names are already locked down. When a pending UFA does make it this far into the season without an extension, there are basically three ways the situation can play out. The first is that they eventually sign during the season and stay with their team. If you’re a fan of a team that has one of those big names above, that’s the scenario you’re looking for. The second possibility is that the player doesn’t sign during the season, but avoids free agency by agreeing to an extension during the offseason. In theory, that’s just as good. But these cases often involve the player being traded first, either as a deadline rental or in one of those June deals that sees his rights dealt in exchange for a middling draft pick. It doesn’t always work that way; as we’ll see, there are players who’ve made it through the season without an extension and then re-upped with their team weeks before free agency, and if you’re a contending team like the Sharks or Blue Jackets, maybe you’re willing to roll the dice while you chase a Cup right now. But if you’re the Senators or Flyers, can you take that chance? And then there’s the third option: The player doesn’t sign during the season, they don’t sign during the offseason and they make it to the free agency period. At that point they’re free to shop their services to any team and the odds of them coming back are slim. So how common is it for a star player to make it to December without an extension? And when it happens, how often do each of those three situations above play out? Spoiler​ alert: Even though​ they​ lost​ last​ night​ in​ Edmonton, the​ Flames are going​ to be back​ in​ this week’s top​​ five. That probably isn’t going to shock you. Calgary remains one of the hottest teams in the league, having won nine of their last twelve to take over top spot in the Pacific. Until last night they’d been filling up the net, raking fourth in goals scored league-wide. But lately they’ve been keeping the puck out too, with David Rittich playing well and Mike Smith suddenly looking like a viable NHL starter again. That’s a tough combo to beat, as most of the Flames’ recent opponents could tell you. They’d won four straight heading into the weekend, which set up a marquee matchup with the Predators that featured the West’s two top teams facing off with top spot in the conference on the line. It was the sort of game that feels like a test for a surging young team, and the Flames passed it by pouring in three third-period goals, turning a tight game into a 5-2 win. After that kind of a season-defining win, maybe it was inevitable that last night’s renewal of the Battle of Alberta would be a bit of a dud. The last time these two teams met, it had us giddy for a potential playoff matchup. Last night looked more like a tired team coming off an emotional win travelling to play a rested rival in a tough building. The Flames fell behind early, had a goal waved off for interference and then spent much of the third killing penalties instead of pushing for the comeback. The Oilers earned their 1-0 win and are working their way back into the Pacific title discussion themselves. But it didn’t feel like they got the Flames best last night. Hey, remember when I made a big deal out of finally putting the Sabres in the top five, then they won the next night and haven’t won again since? I think that may have been my fault. Sorry, Buffalo, won’t happen again. 5. Washington Capitals (17-9-3, +16 true goals differential*) – This week brought a three-game road trip and four of a possible six points. Not bad, although not necessarily the sort of performance that guarantees a spot in the top five. Still, seeing them face down the Blue Jackets in a battle for top spot in the Metro and come away with a 4-0 road win was impressive. Next weekend brings an intriguing matchup against the Sabres and a chance for the champs to continue to defend their turf against the next wave of contenders. 4. Toronto Maple Leafs (20-9-1, +25) – They’re still sitting second overall. But their last two games have been ugly and Saturday’s loss in a nasty game in Boston had to bring back at least a few memories of playoffs past. It will also cost them Zach Hyman, who earned two games for his late hit on Charlie McAvoy. There’s no need to panic, but for now we’ll nudge the Leafs down a spot or two until William Nylander finds his legs and the team reminds us that they can show up before the third period starts.